Yep... that's what I am doing! Moving forward. On day 30 of my 30-day challenge I weighed in at 301.4... that's a 14.6 lbs down! Wow. I feel awesome about that. On Saturday, I had a pre-planned "off" day. Not a "go crazy and eat everything in site day". Just an "off" day... I had a date night planned since the beginning of my challenge, where I knew we would be going to Olive Garden. And I gave myself permission to eat what I wanted. I actually did good! I SHARED an entree with my date, and still had enough to take home in a to-go box... in the past I would have never even considered sharing a plate. I would have never stopped at "Full"... oh, I would have stuffed myself until I was at "Sick and about to Vomit". After dinner we went to the movies. Where I ate nothing. No popcorn or nachos. Not even a diet soda. I was good! Still full from dinner, so why push it? I really enjoyed ice cream after the movie, though. Man it was good, and worth every calorie! It felt like a treat, and that's what it was! But I am learned a lesson from it. Just that quick, I was able to "FEEL" my body make a change from healthy food and exercise, to unhealthy food and no exercise. It was a big change. In just two days! Wow. Lesson learned. Yesterday I was back on track. I figure I have a good 20 days until Easter, so I am challenging myself again for 20 days to journal, eat within my calories, and go to the gym or exercise for at least 40 minutes at least 5 days per week. I know I can do this... I've proven it! 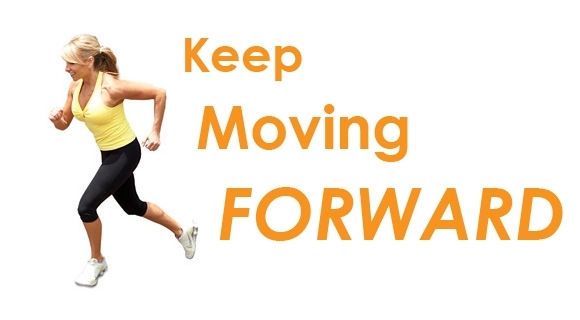 My big thing right now is to just keep moving forward. I am not shedding lbs as fast as I have in the past, but I am okay with that. I will get there! As long as I am moving in the right direction with my food and exercise, the pounds will follow! I am finally teaching myself that HEALTH is my priority, not a pants size or a number on the scale... those things are just the BONUS of living a healthy lifestyle. My boyfriend and I have started sharing entrees at restaurants because they're SO big! It's a little hard to decide something because I'm a vegetarian and he's not, but it makes losing weight a lot easier. I recommend that if you are starting out and want to see great results use: Omni Drops, Omni 4 liquid vitamins, and Fiber N' More. I am also using the Nite Lite, which has helped me get a better night sleep and I know I am losing weight while sleeping! You can continue to use the MonaVie! Great job on the weight loss!! I know what you mean about feeling the days off from eating healthfully and exercising. It is weird to think that is how I felt EVERY DAY before starting my weight loss journey. Now is just feels awful!! Keep up the good work! You are doing great! There's two things you are getting. You don't have to be perfect, there will be bumps just keep getting back to your path. There are unhealthy skinny people, so health is more important than weight, if you are exercising regularly you will be at your correct weight. Winners never quit! Great job on your progress. Keep it up. Once a routine is established it's easier to stay on course it's the little things that throw us off and get us off track. Sounds like you had a great night. Great job on your weight loss!! So true about a weight loss journey becoming more about overall health than a number on a scale. It's taken me a long time to realize this. You are so strong, though! I have had more than my fair share of off days where I would have eaten the entire Olive Garden entree, breadsticks, AND ice cream! Well done on your fantastic loss and sensible choices while out for the evening! I always find that I feel lethargic and just generally a bit yucky after a day or two of eating bad food and not exercising! Actually looking forward to getting back in the gym tomorrow after a few days away! Congrats again on your excellent loss, and keep it up :) look forward to reading more soon! Hi there, I'm a new follower as I've only just discovered your blog. I can relate to what you're saying in terms of I'm not being 'really bad', but I'm also not being 'really good'. Like you, I'm setting a target for Easter - though it's not long away now. Though I suspect part of my guilt and worry is because today I indulged in my first Easter Eggs of the year, and sometimes that leads to an incredible downfall. I've lost a bit of weight over the last year (20+kg / 44+lbs) but have almost that much to go. So... I need to get motivated and committed. Weight Loss is a fun and healthy journey, set a goal, patience and moving forward, yes, moving formard is a key. Hi Hollie, my name is Hollie too! I relate to your renewal of weight loss, I have had success over the years but find myself repeating the same eating errors in food choices and portions. I'm also on a weight loss journey and wish you continued success in yours!